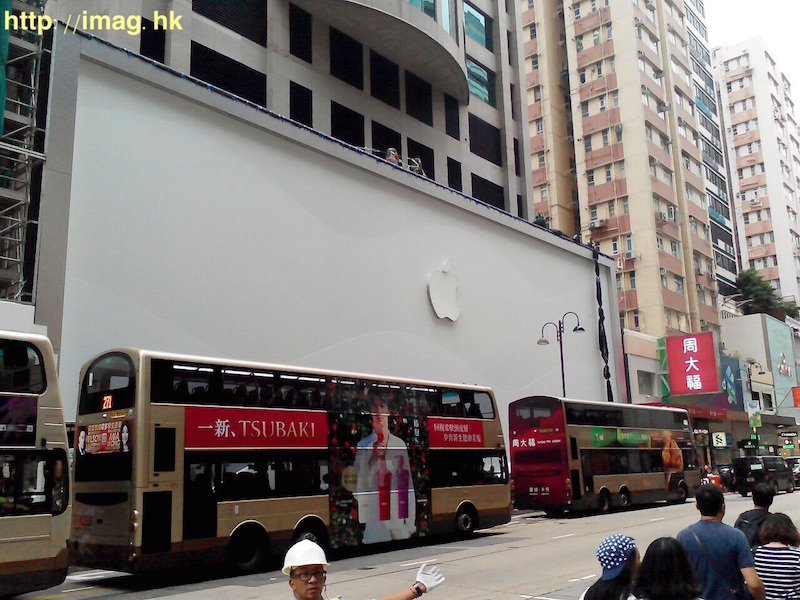 As construction continues on what will be Apple's fourth retail store in Hong Kong, located in the upscale shopping area of Canton Road, new pictures of the store's facade with an Apple logo shared by iMag on Facebook officially confirm that the Cupertino-based company will soon be opening up shop in the area. The store has been planned since at least August 2013 and under renovation for the past several months. The new Canton Road location is expected to be one of the biggest Apple Stores in Asia and will mark the fourth store in Hong Kong alongside Causeway Bay, Festival Walk and IFC Mall locations. It remains unknown when the new store will open to customers, but Apple appears to be in the final stages of construction and should announce grand opening details on its website in the coming weeks or months. To Woo the Chinese customers no doubt. Not to mention, I've always found that as long as I'm polite, they will do everything in their power to go above and beyond their job requirements. Yeah, that's the real kicker. Some people feel that customer service people are there to service their needs only, so they can be rude and patronising to get what they want (customer is always right, etc.). I have little doubt that a majority of bad experiences with Apple are due to this. To anybody reading this: a smile on your face and some simple courtesy - i.e., treat them like a human being, with respect and decency - will get you a long way. Really? How is their customer service in need of improvement? I've been an Apple customer for years, and the only times I've ever left frustrated is when I've done something to my phone/laptop that wasn't covered under Applecare. The thing is, instead of saying they have bad customer service, I acknowledged that the thing that I did was outside of their coverage. Thank you soooooooooooo much for clearing up the nuanced meaning of his post for me. Though this post was from days & days ago, it has been weighing quite heavily on my mind. Now, FINALLY, thanks to your clarification... I can, as you said, relax. Try googling "Apple Customer Service award" before saying something ridiculously stupid on an online forum...!! It is well known that Apple pretty much dominates EVERY single customer service survey in every metric. You're being silly. I looks like the rabid and pious Apple fanboys here won't allow me to have an opinion on THREE of the hundreds of Apple Stores. The fact that you failed to read what I posted afterwards speaks volumes about who's being silly. I am expecting gold tinted windows, gold coloured floors, only gold products on display when the curtain is lifted. Looks like a massive store on a separate note.